North Korea has threatened to go to war over broadcasts across its militarized border that included the K-pop songs of South Korean bands like Red Velvet. On Sunday, Kim Jong Un was clapping along and posing for pictures with the music group. Kim’s surprise appearance at a rare pop concert in Pyongyang was the North Korean leader’s latest diplomatic overture as he prepares for an unprecedented potential meeting with U.S. President Donald Trump next month. Kim first plans to hold a rare summit with South Korean President Moon Jae-in, who has pursued reconciliation with North Korea to avert war over the regime’s nuclear weapons program. 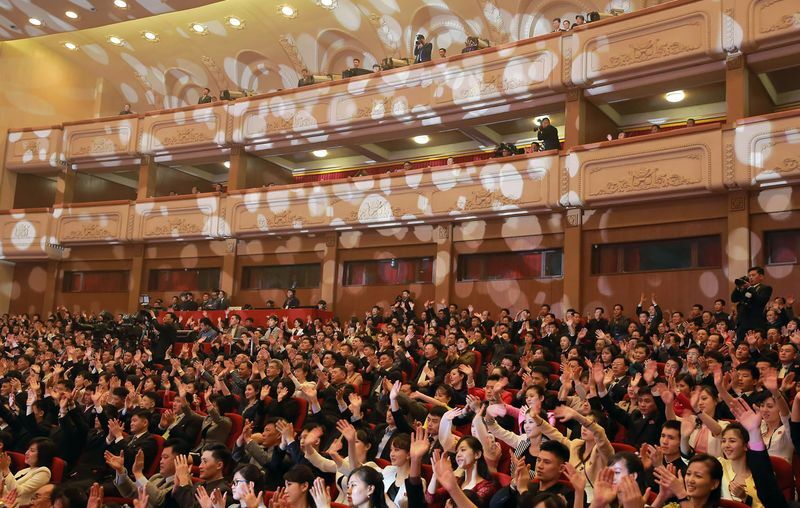 After listening to the band belt out dance tunes including “Red Flavor” and “Bad Boy” to about 1,500 members of the North Korean elite at the East Pyongyang Grand Theater, Kim called for a similar performance in Seoul later this year. “I understand people were curious to see if I would come to see Red Velvet’s performance,” Kim said, calling the show a “present” to North Korea’s citizens. After a similar attempt at K-pop diplomacy received a frosty reception 15 years ago, Red Velvet’s members expressed surprise at the welcome they received from the North Korean spectators, who waved their hands and sang along to the songs. South Korea has in recent years added K-pop to its propaganda broadcasts across the demilitarized zone, a practice that has prompted threats of military action by North Korea. Kim’s appearance comes a week after he shook up the Asian diplomatic landscape with an unexpected trip to meet Chinese President Xi Jinping in Beijing — his first overseas trip since taking power in 2011. The planned inter-Korean summit with Moon on April 27 is expected to pave the way for a similar meeting with Trump, who wants Kim to abandon his nuclear weapons. The concert was held on the same day as the U.S. and South Korea launched mass military drills that North Korea views as a rehearsal for war. Official North Korean media had said nothing about the exercises as of Monday afternoon, in contrast with threats of military retaliation in past years. 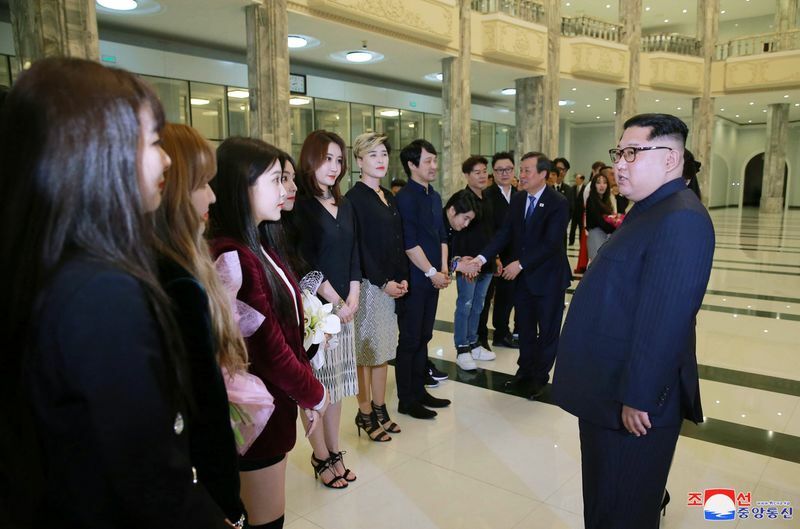 Kim met with Red Velvet and other South Korean performers after the show, shaking hands with them and expressing his “deep thanks,” according to the official Korean Central News Agency. 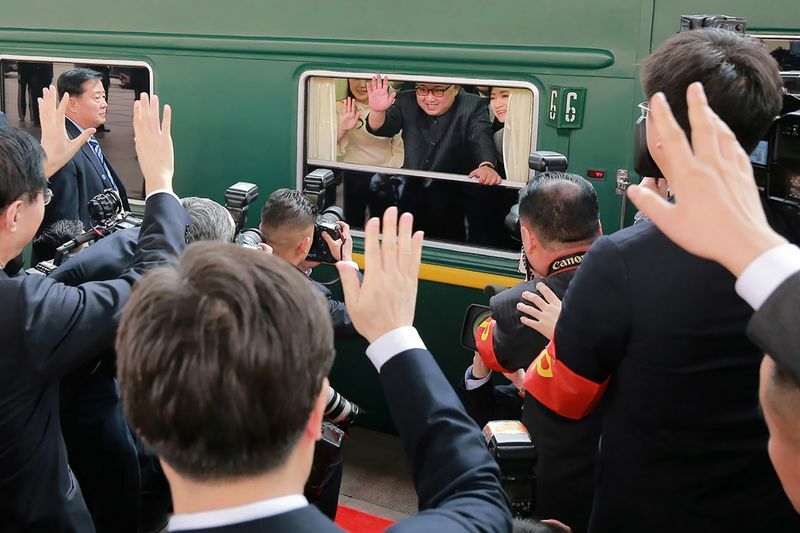 Kim said he was “deeply moved to see our people sincerely acclaiming the performance, deepening the understanding of the popular art of the south side,” KCNA reported. When South Korean boy band Shinhwa performed in North Korea in 2003 as part of a similar cultural diplomacy venture, the audience — dressed in suits and traditional dresses — greeted them with silence and stony stares. One of the band members, Eric Mun, told reporters that they looked at the singers “with eyes like shooting lasers,” according to Yonhap. That year, North Korea withdrew from the nuclear Nonproliferation Treaty and threatened to test atomic weapons. U.S. President George W. Bush had labeled the country a member of the “axis of evil” in 2002. This time around, Kim is seeking to engage the region’s major powers after advances in his nuclear program prompted the United Nations to tighten sanctions and Trump to threaten war. But it’s the shifts in technology since the early 2000s that may be giving this year’s musical extravaganza more impact, said Kang Dong-wan, a professor at Dong-a University and a leader of the Busan Hana Center, an institute that helps North Korean defectors in the South Korean port city of Busan. K-pop — characterized by its manufactured melodies and slick approach to marketing — has penetrated into North Korea over the past 10 years. Smuggled across the border on flash drives sticks and bootleg DVDs, K-pop has spread widely among the families of North Korea’s political elite, Kang said. Red Velvet — which performed an invite-only concert at Credit Suisse Group AG’s Asia investment conference last month — is being joined in Pyongyang by South Korean singer Baek Ji Young and rock band YB. A second show Tuesday will be a joint performance featuring acts from both Koreas and will take place at a 12,000-seat stadium in Pyongyang.